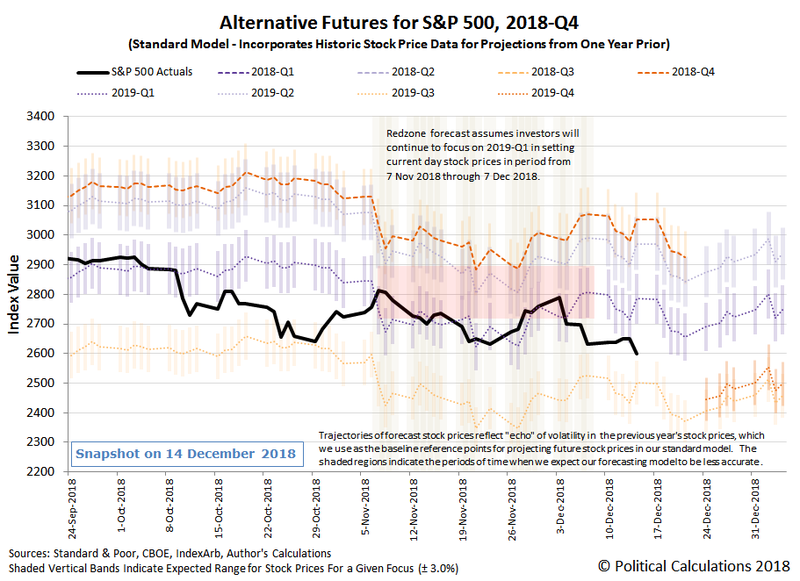 As we enter the final full week for trading in 2018, we find that S&P 500 (Index: SPX) investors appear to be splitting their forward-looking attention between the first and third quarters of the new year in setting today's stock prices. We believe the reason for this split is two-fold. First, political control of the U.S. House of Representatives is changing from the Republican party to the Democrat party in 2019-Q1, which will come with a host of policy changes that can impact the outlook for businesses and the economy depending upon how far they might be expected to advance. Second, investor concerns about the Fed's plans for future rate hikes are now at elevated levels because of the recent partial inversion of the U.S. Treasury yield curve. Further Fed rate hikes can only exacerbate that situation and increase the likelihood of a recession given the current market environment, where the Fed is expected to hike rates by a quarter point later this week. The bigger question is how many more hikes will follow in 2019? A month ago, investors had been anticipating two rate hikes in 2019, one in March 2019 and another in September 2019, following the long anticipated hike in December 2018. Two weeks ago, investors were betting on the scenario that there would be at least one hike in the next year, coming in June 2019. In a sign of how rapidly expectations for the future are changing, as of Friday, 14 December 2019, the CME Group's FedWatch Tool is still forecasting just one Fed rate hike in 2019, which has been pushed out into September 2019. The following image captures the FedWatch Tool's estimated probabilities for rate hikes by amount and date, which indicates that there is a greater than 50% probability that the Fed will hike its Federal Funds Rate to the 2.50-2.75% (or 250-275 basis points) range or higher at the conclusion of its 18 September 2019 meeting during 2019-Q3.